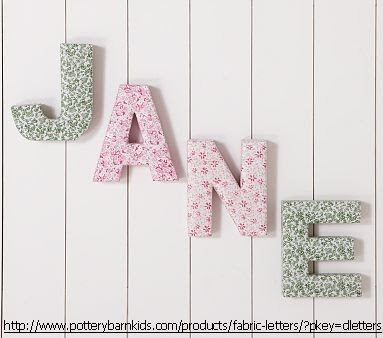 My friend sent me an email yesterday with a link to fabric covered letters from PB kids. She wondered if it was something that could be done at home instead of paying the $12 per letter that pb was selling them for. I'm always up for a good challenge. This morning I headed to Joann fabrics for some misc. items. I happened to pass an aisle with letters galore. They were on sale, too! For $2 I purchased a paper mache' letter E.
I bought some Mod Podge fabric glue with my 50% off coupon (total: $3.50). I knew that I had my cute bird fabric at home. The E is not the easiest letter to get fabric around, but I made it work. First, I traced the letter on the wrong side of the fabric adding a couple of inches off of the left so that I could fold it and glue it to the side of the letter first. I then cut one long strip of fabric and glued it to the inside of the letter. The glue is great. I used the sponge stick to lightly spread the glue on the fabric. You then place the fabric on and smooth it in place with your finger. For the edges that are sticking off of the letter, you clip the corners, then fold them down and glue them to the letter. Fold the tops and bottom loose fabric like you're wrapping a present. After this step, you cut out the letter you traced, but add approx. 1/4 to 1/3 inch around the whole tracing so that you can fold it under and glue it so that no seams are showing. The tricky party is when you get to the inside "leg" of the letter. Just keep cutting and folding until no raw edge shows. Like I said, the glue is very forgiving. You can peel the fabric away and re-tuck it if you still have a lot of edge left. Here is a close up of the front. You can see that the fabric is folded. Don't worry about getting glue on the fabric front. It dries clear. I think that it turned out pretty cute for $5.50. Half the price of pb kids and I can use the glue on a number of other projects. It's hard to write a tutorial for this since I only did the letter E, and each letter will require different cutting/ shaping. Please feel free to email if you have any questions. The glue works wonders. Sweet! Love this and exact instructions are a huge help!!! !